I started out this project by building the underlying model of the blocks and the board, including the logic to shift the blocks around. This was done in a test-driven manner, which helped to drive out the model and behaviour correctly and to identify edge and corner cases early. Towards the end of this process, I discovered a similar puzzle game on clickmazes.com and contacted them to ensure I wouldn't be violating a copyright. They were happy for me to proceed and gave me permission to use two of their puzzles too. Once enough puzzles had been designed, I tailored the solver to determine various things about each puzzle such as the number of solutions, the number of moves in the best solution, the number of useful positions in the solution tree (positions from which the puzzle can be solved), the number of dead-end positions (positions from which the puzzle cannot be solved), and so on. This proved to be quite CPU-intensive on the more complex puzzles, so it was compiled and run on my Mac rather than on the iPhone. These values were then used to assess the relative difficulty of each puzzle. 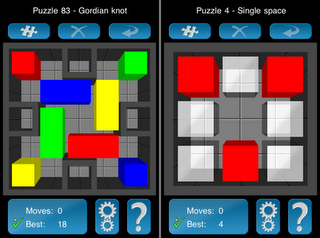 Every puzzle included in the game was thus designed by hand, but assessed and verified by code. Finally I wrote the actual application, including in it the 110 puzzles that had been selected for the final application, in a local SQLite database. Like the solver and the puzzle builder, the actual game was built on top of the model built initially. I started this application in early December 2008 and finished it in late April 2009 - nearly five months of much of my free time went into building it. I am happy with the end product and hope that those who purchase it enjoy playing it as much as I enjoyed creating it. It's available on the App Store now. You rock. Imagine how many you could pump out if you went full time!